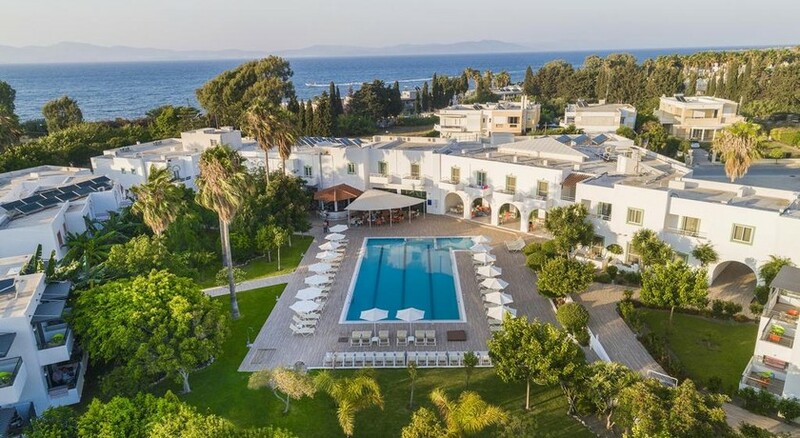 Alexandra Beach Hotel & Apartments is a semi-luxuries property located in Kos Town, Mostly visited by couples, families and group travellers; this hotel features self-catering and bed accommodations. The UPS of the hotel include the rich ambiance and the relaxed surrounding it offers. Accommodations in Alexandra Beach Hotel & Apartments are divided into standard rooms (2 guests), studios (3 guests) and apartments (6 guests). These modern and spacious rooms are functional in style and come furnished with facilities kitchenette. You will find coffee/tea machine, mini fridge, electric hob, toaster, microwave, and other basic kitchenware and cutleries. Standard facilities across the rooms also include air conditioning, en suite with amenities, hairdryer, TV with satellite and more. Apartments are further divided into one, two and three bedroom apartments and they come with separate furnished living room. All the rooms have a decent size balcony and they overlook the pool, mountains, sea and garden views depending on the location. Housekeeping and fresh towels and linens are provided daily or when requested. The hotel boasts a breakfast lounger where continental breakfast is served—you will find scores of varieties in the menu. Also, there is a poolside bar where most mixes and infusions and alcoholic and non-alcoholic drinks are served from morning till late in the evening. And if self-catering is not on your mind, you will find few family-run hotels in the neighbourhood, even otherwise the city centre is hardly 15 minutes on foot where you will find tons of restaurants, cafes and bars. During the day time, you can either visit the beach or soak in the large outdoor pool within the premises. 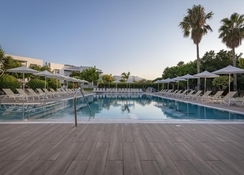 There is a children’s paddle pool and loungers and parasols are complimentary for guests—approach the front desk for lilos and beach towels. There is an internet corner and a children’s playground and a common TV lounge. Recreational activities such as water polo, water volleyball and water gymnasium are possible, if that do not interests you there are table tennis, billiards, darts and tennis court within the compound. 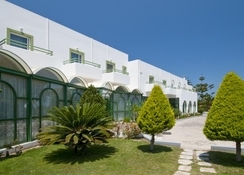 Alexandra Beach Hotel & Apartments is a four-star property located on the outskirt of Kos Town. It houses 106 rooms and apartments, all with views of the surrounding. The harbour is about 500 metres from the complex and should you wish to explore the neighbourhood, there are few family-run restaurants and cafes. It hardly take about 15 minutes to reach the main strip where you will find tons of restaurants, bars, cafes and shops and the vast sandy beach is roughly a kilometre away. Land and sea excursions are common among travellers--Kos Island International Airport is approximately 23 km from the hotel. Pets	Free! Pets are allowed on request. No extra charges.